Home › Art › What is ME/CFS? It’s a simple question for a complex illness – just what is ME/CFS? 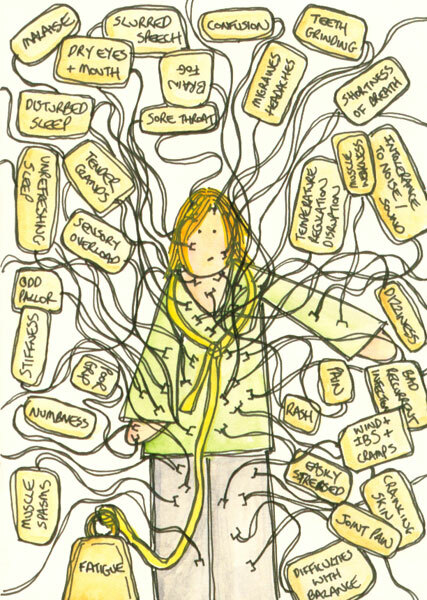 When I tried to think of a drawing to do for my post for Blogging for ME/CFS Awareness 2008 I wondered what could I possibly hope to illustrate about this complicated condition with a simple drawing? So here’s what I can (remember to) tell you about CFS/ME. It’s a crap illness to have. No-one can tell for definate why you have it, what’s causing it, how long you’ll have it for, how it will manifest from one day to the next or how to cure it. The media has a hang up about it’s past and continues to fuel some (unfounded) stigma for having it. Patient groups, health professionals and sufferers bicker about what to call it, how to treat it and what is causing it. Under investment in research, treatment and awareness over the last 25 years have only increased friction. It can mask many other conditions resulting in misdiagnosis and also bears an uncanny resemblance to many other conditions. You can have a ‘clean bill of health’ in every blood test and still feel worse or be more debilitated than cancer patients undergoing chemotherapy or people with MS, end stage renal disease or AIDS. (Sources 1, 2, 3). There’s very little which gives sufferers relief but it doesn’t take very much to make them feel worse than ever. CFS/ME is also more than just feeling tired and needing to stop in bed. It’s utter exhaustion. It’s having little or no energy. It’s like having a battery that can’t hold it’s charge. It’s having just a few spoons or less a day. It’s pain and aches and migraines and stomach cramps and bowel problems. It’s a cloudy brain and getting confused and not remembering and trouble speaking and a fog within your mind. It’s having little or no reserves and not being able to exert your body without triggering crashing fatigue and/or a myriad of other symptoms – which will last for a day or a week or months or years. It’s walking a tightrope trying to keep away from things that might (or might not depending on that phase of your illness) worsen your condition but trying at the same time to have some quality of life. It’s trying to protect yourself without wrapping yourself in cotton wool for fear of making yourself ill.
It’s draining and seemingly unrelenting and never feeling refreshed or revitalised. It’s unpredictable and ever changing and challenging and destructive to relationships, family, jobs, esteem and all aspects of your life. If I exert myself I don’t just feel tired afterwards. It’s so much more complex than that. Firstly, an exertion can be physical (as in doing the washing up, walking to the corner shop) but it can also be mental (like having an animated discussion, or figuring things out) or emotional (like feeling stressed or worried, getting very excited, grieving). Exertion for a CFS/ME sufferer can be more than just housework or walking or exercise. Secondly, although the most common reaction to exertion is a “malaise” afterwards this can be immediately afterwards or it can take a couple of days for the ‘payback’ to present itself. Certainly for me and many others it’s not just about feeling tired (well, actually exhausted and wiped out). It’s also about my tummy and bowel, my migraines, my aches, my pains, my sleep being disrupted, my vision going weird, my breathing, my speech ceasing up and slurring, my words getting muddled, my ability to remember erroding – even dizziness, numbness, muscle spasms, crawling skin and any number of many more unpleasant things. As these symptoms creep up on me, the greater the exertion the harder they hit and the longer they last. If it was just a case of feeling a bit tired and needing a little rest maybe it would be easier to manage. Have you ever been knocked off your feet by a virus and struggled to get out of bed? That’s how I feel every single day – but I still have to wash, I still have to eat, I still have to brush my teeth and take care of business and keep in touch with people and have a life. And every morning I wake up and find that sleep doesn’t refresh me or recharge my batteries. In fact I have a huge list of symptoms not all of which I have all the time nor can I predict what combinations I may have at any one time. Now I know all of this probably sounds pretty depressing but please remember what I said at the start about ME/CFS being complex. I think we can include living your life with this debilitating condition as part of that complexity. It can be challenging, devasting and absolutely awful. But happiness is possible. I think I have shown throughout my artwork and blogging here that life can be good despite CFS/ME. As today is International ME/CFS Awareness Day I thought I’d talk about defining what this illness means – especially as talking isn’t something I usually do a lot of on this blog. If you’re reading this because you searched for answers about “what is wrong with me” (a question I still find myself muttering on the difficult days) or even what’s wrong with my wife, my brother, my colleague or so on … and some of this sounds familiar, then allow me to give you some sign posts to some less personal answers. The cardinal symptoms of ME are profound, generalised post-exertional loss of muscle power (fatigability); muscle pain that may include tenderness and swelling; and neurological signs. Patients are also prone to relapses which may take the form of recurrences of the original systemic illness, or fresh episodes of muscle weakness, neurologic changes or well-defined cognitive problems. As with many chronic illnesses, fatigue may be present, but in ME patients the fatigue is post-exertional, often delayed, and quite unlike the ‘fatigue’ experienced by healthy people. All types of people at all ages are affected. Imagine feeling exhausted after walking two blocks, having chronic sore throats and muscle and joint pain. Imagine your head feels stuffed with wet sand and when you try to read, words swim on the page. Imagine feeling heavy and sluggish rather than rested after a night’s sleep. And imagine that these ailments last for years. These are some of the symptoms of chronic fatigue syndrome … a serious and disabling illness that is now one of the most common chronic illnesses of our time. It is also one of the most misunderstood. The symptoms of CFIDS are highly variable and fluctuate in severity, complicating treatment and the ill person’s ability to cope with the illness. Most symptoms are invisible, which makes it difficult for others to understand the vast array of debilitating symptoms with which people with the illness must contend. Additional symptoms are reported by people with CFIDS (PWCs) such as word-finding difficulties, inability to comprehend/retain what is read, inability to calculate numbers and impairment of speech and/or reasoning. PWCs may also have visual disturbances (blurring, sensitivity to light, eye pain, need for frequent prescription changes); psychological problems (depression, irritability, anxiety, panic attacks, personality changes, mood swings); chills and night sweats; shortness of breath; dizziness and balance problems; sensitivity to heat and/or cold; alcohol intolerance; irregular heartbeat; irritable bowel (abdominal pain, diarrhea, constipation, intestinal gas); low-grade fever or low body temperature; numbness, tingling and/or burning sensations in the face or extremities; dryness of the mouth and eyes (sicca syndrome); gynecological problems including PMS and endometriosis; chest pains; rashes; ringing in the ears (tinnitus); allergies and sensitivities to noise/sound, odors, chemicals and medications; weight changes without changes in diet; light-headedness; mental fogginess; fainting; muscle twitching; and seizures. A Hummingbird’s Guide To M.E. ‘Fatigue’ and feeling ‘tired all the time’ are not at all the same thing as the very specific type of paralytic muscle weakness or muscle fatigue which is characteristic of M.E. (and is caused by mitochondrial dysfunction) and which affects every organ and cell in the body; including the brain and the heart. I think you came up w a terrific drawing!! — all those tags……………………sigh. Wow, this is an excellent post and really gives a clear and comprehensive picture of the condition & life with it. Well done for being so coherent and organised! There are certain people i wish i could get to read this so that they would understand my life better, but i know there is little point… if they haven’t got it yet they never will! Great post Rachel,that drawing says it all. I can imagine the drawing will be popping up on ME/CFS advocates’ website or cover for ME/CFS related books. Your post is amazing and well explained about the symptoms and problems comes with ME/CFS. I have never blogged and was excited to see that this exists. I have just started to read this site and see that you are being very thorough. May I suggest the Canadian Consensus Document for Physicians of ME/CFS Patients. It is an excellent tool to learn more about this disorder as well as an even better tool for doctors who are very interested in learning in order to help their patients. Mary Schweitzer has come up with a petition to urge the adoption of this document for educational purposes until the USA has developed their own. There were a couple of USA physicians who were involved in the development of the Canadian document. Keep up the great work. I look forward to reading more. Had the annoying PVF for 18 months now. It’s going slowly and I’m working part time. However I’ve just inherited this new weird tingling numb face symptom, particualrly at night when I’m on the computer. i.e now. Oh well – At least I kow it’s just another symptom and that i’m not a hypercondraict or going to die. I am with you. I have tingling face ALL the time. My CFS followed my 8 month bout of Mono. CFS is one of the worst things I have ever dealt with. anyone else have tingling face from this? If so any tips on what might help? Well it’s great o thear you’ve been makign a steady recovery. Tingling numb face is a bit distressing huh? Hope you have a good doctor that you can talk to. Best to get new symptoms checked out just in case. Hope it passes quickly though!